Any documentation, in any format can be uploaded and stored in Ornavi in the Files tab of any job folder. Storing items such as delivery notes, supplier quotes or warranty certificates in the “Ornavi Cloud” means you don’t have to worry about back ups and data storage security. You will also have access to these files from anywhere, at any time. 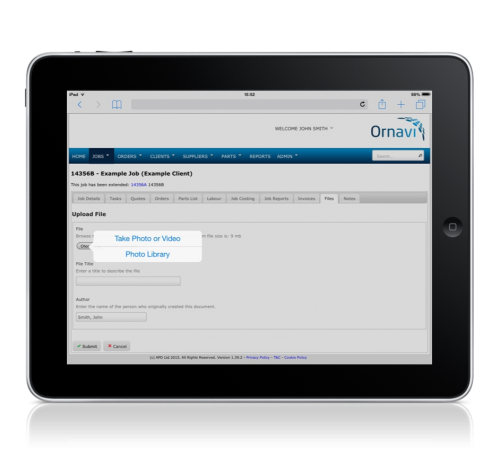 The file must be on your PC to be uploaded to Ornavi. If you wish to upload something that exits as a paper copy currently, then you will first need to scan it in to your PC. Open the job folder and navigate to the Files tab. If your file is to be stored within a specific folder then first click on the folder. Once you are in the location you would like the file to be uploaded to then click on the [Upload Files] link at the top of the tab. File: Click Choose File (or your browser equivalent) to browse your computer files. Once you have found the file you wish to upload, double click to select it. You can upload several files at once. Title: The Title field will automatically display the name of the file but it can be edited to suit. Note: The file Title cannot be edited after the file has been uploaded. Author: This field will automatically display the name of the user that is currently logged in but can be edited to suit. Click Submit to finish uploading your file(s). If you have a smart phone or tablet you will have the option to open your camera roll or access the camera. Opening the camera roll will allow you to select from the Upload tool to take photographs and save them to Ornavi. This means paper certificates etc. can be photographed and uploaded without the need for scanning them onto your PC first. There may be slight variations in instructions and behaviours across different operating platforms on smart devices. File: Click Choose File (or your browser equivalent) to either open your camera roll or activate your smart device camera. Then either select the image(s) or take the photo. Title: This field will automatically display the name of the file(s). Photo files from a smart device normally have long numerical file names so you may wish to edit it. On the file tab main view, notice the Options column on the right hand side. Here you will see a View icon that looks like a magnifying glass. Click to open the file. On the file tab main view, notice the Options column on the right hand side. Here you will see a Delete icon that looks like a rubbish bin. Click to delete the file. This cannot be undone. You can edit the names of the folders on a per job basis (see below) or you can edit the default folders available for all jobs from Admin > System Settings > Customisations. On the file tab main view, click the option to [Create Folder] next to the Upload options. Simply name your folder and click Submit. If you wish to add files to a specific folder, be sure to open the correct folder first. Files cannot be moved folder at this time. On the file tab main view, notice the Options column on the right hand side. Here you will see an Edit icon that looks like a magnifying glass. Click to edit the name of the folder. On the file tab main view, notice the Options column on the right hand side. Here you will see a Delete icon that looks like a rubbish bin. Click to delete the folder and all of its contents. This cannot be undone.